It took almost a week to identify it, but I’ve nailed down the best part of our recent trip to Mexico’s Yucatán peninsula: swimming in the ocean (er, the sea. The Caribbean!). The warm water, the extra buoyancy that the salt water provides, and the strange, puny-feeling yet very connected-to-everything sensations while being carried up, down, over, and out on big (two to four-foot differentials) rolling waves. 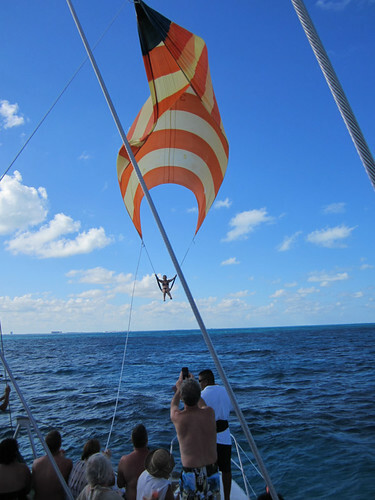 We went snorkeling, one afternoon, as part of a catamaran excursion to Isla Mujeres. The snorkeling itself wasn’t very good, mostly because of the turbulence. However, in between moments of establishing security by finding Steve’s bobbing, snorkeled head, I had some very calming moments. Gently shifting about, above the disappointingly infrequent sightings of fleshy coral and blue, orange and yellow fishies had a sort of timeless, softly-frozen (like Jell-o?) feeling. I went to the Y to do some lap swimming this past weekend and had a few moments when another swimmer’s wake in the pool reached me, and reminded me of our ocean swim just over a week ago. Even during the excursion I remember noting that this was one of the better parts of the day, but looking back, it really was exceptional, partly as the waves were far enough apart that they didn’t sneak into the snorkel. We had flotation belts on that also made intentional movement fairly effortless, and the fins we wore let us completely relax our arms. I’ve snorkeled in really choppy, cold water, and I’ve been lucky enough to snorkel in completely calm water in a particularly beautiful reef, a few times. This recent experience was very different from my prior snorkeling adventures! In the pool last weekend, the similarity of those Caribbean waves to the rhythm of the breath of something very, very large struck me. As long as I don’t picture the big space slug in Star Wars, this is a very positive, reassuring visualization. Life breathes. Reading can be relaxing and enjoyable! Whew. It was nice to do some lighter reading, compared to the sometimes dense, often challenging yoga scriptures I’d been working on, this fall. My favorites of the books read there were Eye of the Fish, Hell-Bent: Obsession, Pain, and the Search for Something Like Transcendence in Competitive Yoga, and The Bartender’s Tale. Sunshine sure feels good. We didn’t spend that much time out in its direct glare, but we had a few activities that took us out there. 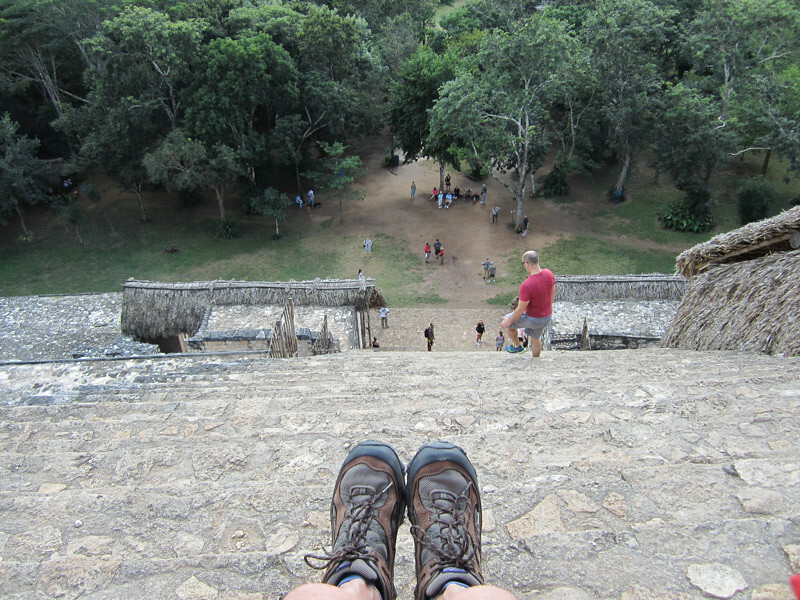 The best was a visit to the Mayan ruins of Ek’ Balam, which was new for us. Our excellent Xel-Ha tour guide, Irving, taught us how to count, Mayan-style. I’d like to learn to speak Spanish. Those v’s and hard consonants are intriguing, and if I come back to Mexico, I’d like to have that additional tool at my disposal, to seek out things I’d like to do and to get to know some locals. There is an additional item from the vacation that has had a surprisingly lasting effect: the food. We ate a lot of it while there, and while it may be awhile before we go out for Mexican food again, I’m glad we have a good cookbook, Rick Bayless’s Mexican Kitchen. We’ll be making a mole dish from it, this week! I’m glad we live near a good Mexican grocery, El Burrito Mercado. More photos from our trip can be viewed here, in a Flickr photoset.